Transform your back yard into your own private resort with a PBPools Polymer Pool Walls InGround Swimming Pool by Hydra Pools. These pools are designed with the do-it-yourselfer in mind. Manufactured from high impact polystyrene and molded under carefully controlled conditions to form modules with uniform cellular structure and thick, tough skin, while keeping the flexing strength needed for buried structures. 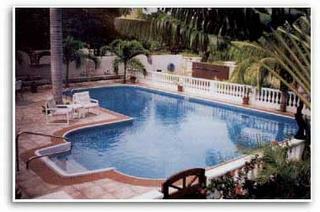 PBPools Polymer Pool Wall systems cannot rust, corrode, rot, crack or splinter. Enjoy a lifetime of fun backed by a transferable lifetime warranty. Building with a PBPools Polymer Pool Wall kit will turn your back yard into an oasis in now time. Create a great place for entertaining and getting together with the family. Wall and Bracing System: PBPools Polymer Pool Walls and braces are molded to exacting specifications based on through research and engineering. Each of the straight length and radius panels have uniform rigidity, flatness and strength, derived from the strategic placement of ribs. These polymer panels are the most resistant to all types of underground deterioration. Polymer walls and braces cannot rust, erode, rot, crack, or splinter. In addition, they offer a higher strength-to-weight ratio than steel, and are surprisingly light weight for ease of installation. There is no stronger, more functional brace in the industry. Fastened at the five stud-and-socket locations, the brace features a wide rear stabilizing pad that uses backfill pressure to keep walls plumb and straight. A polymer stake provides added support in most conditions, but in very rocky soil, a heavy steel drive stake is available. The 5 inch wide by 28 inch top surface of the deck-support brace is designed at an angle to align with proper drainage slope of decks. Joining system: PBPools Polymer Pool Walls systems are engineered for long-term structural integrity over the lifetime of the pool. All panels are joined by a system of five stud-and-socket structures that are automatically precision-aligned as the panels are put in place. Non-corrosive fasteners then join the panels together as a durable unit. Alignment Coping: Hydra-s specially designed alignment coping encapsulates the entire top surface of wall panels, providing precision-engineered alignment. Designed to act as part of an integral pool unit, this system enhances the stiffness and long-term durability of our pools. Sweetwater Steps from Hydra Pools has become one of the most trusted names in swimming pool performance. By staying current with the most up-to-date sciences and technologies, Hydra has achieved a truly modern and quality product. The Sweetwater Step are vacuum molded at the Hydra facility from Luran, a state-of-the-art material which offers strength and durability superior to traditional steps made of vinyl coated metal or acrylic and fiberglass. Hydra Virgin Vinyl Liners are among the most stylish in the pool industry. They are simply the best liner on the market. Hydra Pools Vinyl Liners are made using state-of-the-art technology, which allows them to withstand years of exposure to the sun, water, chlorine, extreme temperatures, and everyday use. Hydra Vinyl liners are sealed with a clear coating, making them as resistant to abrasion and soiling as possible. As an added bonus they also have a built-in fungicide to reinforce the effectiveness of normal pool chemical treatment. The Hydra Vinyl Liners are manufactured at Hydra by a computer-controlled process for exceptional uniformity and strength. These 20-mil, 25-mil, and 28-mil liners carry a 15-year pro-rated warranty. The true measure of any products quality is the confidence its manufacturer has in its longevity. At Hydra, the confidence they have in their products is unsurpassed in the industry. The precision engineering and no-compromise manufacturing policies assure you of a pool that is built to last. Hydra is so sure of the quality that they back the wall panels and braces with a remarkable transferable lifetime warranty. Download your inground swimming pool instructions here. This is a PDF file. The purpose of the pool base is to provide a smooth surface for the pool liner. A smooth surface is less abrasive on the liner and makes it easier to keep the pool clean. There are four choices to use for the pool base. 1) Sand, 2) Sand and portland cement, 3) Sand, portland cement and vermiculite or 4) vermiculite and portland cement. 1 Sand is the most economical and works well in play pools that do not have a steep slope. The amount needed will vary by pool size. The sand should be mason's quality and spread about 1"- 2" thick. 2 The most common used pool base throughout the years has been a mixture of sand and portland cement. Portland cement is available from your local hardware store. 3 The best pool base for most homeowners is the sand, portland and Vermiculite mixture. It is economical and provides a smooth soft surface. This is also a way for pools in high water table and hard freeze areas to minimize the amount of sand used in the base. 4 The vermiculite and portland cement mixture can be purchased in two forms. The pre-mix also known as pool-crete is mixed with water. The pre-mix can be difficult to work with and more prone to problems than the more economical to ship, Vermiculite that is mixed with portland cement and water. Additional mixing and application information is provided in the Inground Swimming Pool Installation Manual. The actual amount of material needed will vary depending on the dig and thickness of the base used. This table can be used as a guide. It is based on a 2" thick pool base. The sand/portland mix or the sand/portland/vermiculite mix is generally the best choice for most homeowners. The Portland/vermiculite mix should be used for high water table areas and hard freeze areas.